Both cities offer a wide array of venues and are home to diverse genres of artists. A large migration of poor African Americans from the south during and in the immediate aftermath of the Great Depression brought blues and jazz to Chicago. The importance of this migration cannot be overstated as it laid the foundation for soul music in the 60’s which in turn paved the way for hip hop in the ’90s and 2000s. Milwaukee was a prime destination for German and other European immigrants in the early 20th century. Les Paul, a Milwaukee native of German descent, is renowned for the invention of the solid-body electric guitar, neck-worn harmonica and many innovations in recording techniques. Milwaukee and Chicago are also home to two of the best music festivals in the United States: Summerfest and Lollapalooza. Summerfest, which bills itself as the largest music festival in the world, takes place over 11 days on 11 stages on the Summerfest grounds along Milwaukee’s lakefront. The festival drew nearly 800,000 people last year. The headliners for 2016 include Selena Gomez and Blake Shelton. Initially conceived as part of a farewell tour in 1991 for Jane’s Addiction, Lollapalooza has since been retooled into a global destination music festival with dates in Chicago, Santiago, Chile; Sao Paulo and Berlin. Along with Bonnaroo and Coachella, Lollapalooza is among the most important music festivals in America. The diverse venues musicians in each city have to choose from really differentiates the music scenes between the two cities. Andy Nelson, director of public relations for the Pabst Theater Group, first fell in love with Milwaukee’s music scene when he attended a Bright Eyes concert in 2005. It can be tough to draw big acts to a relatively small market like Milwaukee, especially with Chicago in close proximity. To combat this, venues such as those operated by The Pabst Theater Group use hospitality to their advantage. Artwork and comfortable furniture adorn the green rooms where artists wait before performances at the Pabst, Riverside and Turner Hall. Performers can play classic video games, listen to vinyl records or even grab a latté from Colectivo minutes before they take the stage. The theater also employs professional chefs to cater to different artists’ appetites. 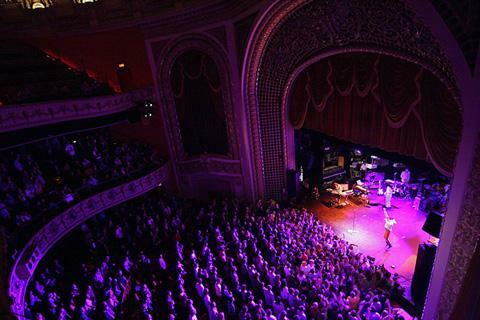 Nelson said that the Pabst Theater Group also extends the same level of hospitality to concertgoers. He said the theaters employ a respectful event staff, utilize a simple process for purchasing tickets and keep drink prices as low as possible. While low prices do not make business sense on paper, Nelson said repeat customers greatly offset the cost. According to Billboard, the average concertgoer attends one to three concerts a year. He said the average Pabst customer attends 10. In order to remain financially viable in cities with small populations, venues like the Pabst must develop loyal customers. Despite the challenges with operating in a small city, Nelson believes it is more rewarding. Chicago’s storied music scene has given rise to some of the most critically acclaimed and commercially viable musicians of the 20th and 21st centuries. Kanye West, Lupe Fiasco, Chance The Rapper, Chief Keef and many more have all come from Chicago over the last decade and a half, releasing diverse and socially conscious music that frequently references their collective hometown: Chi-town. The city’s musical and racial diversity spurred the development of eclectic clubs and allowed for venues of all sizes to survive. Large venues like the United Center, which also hosts the Blackhawks and Bulls, can hold national acts while smaller venues like The Empty Bottle cater to a more intimate crowd. The House of Blues in Chicago hosts an assortment of talented local and national acts. Although it only holds about a thousand people, some concertgoers prefer the intimate environment. The vertical seating structure of the theater guarantees that no matter where an attendee sits, they will be close to the stage. Ryan Hayes, a senior in the College of Engineering, prefers small venues like the House of Blues in Chicago over larger ones such as the Aragon Ballroom. Lamy Chopin, a junior in the College of Engineering, echoed Hayes’ remarks. He sees intimacy as one of the principal components of an excellent concert experience. No matter what concert environment music fans crave, Milwaukee and Chicago can meet their needs. A 40’s style neighborhood bar serving American craft beer and fare. A modern Chinese restaurant with a full bar located near the Aragon Ballroom and Riviera Theater. A modern Chicago wine bar offering fresh food and selections of cheese. Spy-themed restaurant with a distinctive design and themed bar. A traditional Irish pub serving some of the emerald isle’s finest cuisine and drink. A brewpub offering house brewed beer and upscale American cuisine. An upscale bar offering a variety of microbrews from their 36 taps in addition to wine and cheese.